Soaring business rates have “strangled” the north-east’s economy, it has been claimed. Tens of thousands of companies have challenged their bills following a controversial rates revaluation in 2015. Last year it emerged that firms were being charged by typically more than a fifth because the valuation was based on the period before the oil and gas downturn. This prompted an outcry and the Press and Journal launched a campaign to try and persuade the Scottish Government to overturn the bills. Eventually the then finance minister Derek Mackay bowed to public pressure and introduced a 12.5% cap on bills for the hospitality and office sector in the region, which was extended until next April. 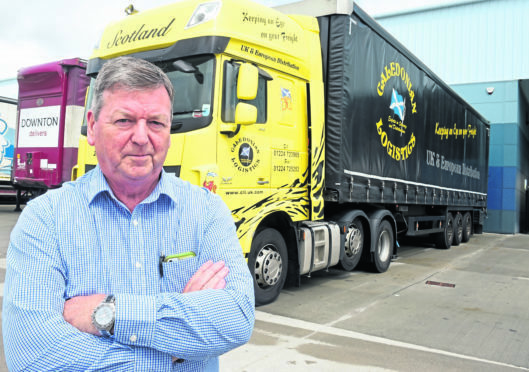 North-east haulage firm Caledonian Logistics is the latest to reveal an eye-watering increase. The firm’s Oldmeldrum headquarters’ value has leapt from £232,000 to £336,000, and its Kintore depot has gone from £113,000 to £163,000. Derek Mitchell, managing director, said: “Between Oldmeldrum and Kintore our bills have gone up by more than £80,000 a year. “There’s not been an increase in the size of the sites or the services that are going on there. “The knock-on effect has also meant we are paying higher water rates, so we’re handing over £900 per month for the Meldrum site. We’ve got two toilets and one tap. We don’t even wash the lorries there. Colin Clark, Gordon MP, said that more needed to be done to support businesses in the region. He said: “The north-east is the engine room of the Scottish economy and the SNP government is strangling it. “The SNP finance secretary must look at the damage being done. Last month, Mr Mackay launched a national consultation into rates. He has previously promised to go beyond the 30 recommendations of the Barclay Review, which was published earlier this year. Among the raft of measures promised by the minister is that new or improved properties will be protected from business rate rises for a year under a Growth Accelerator scheme. Another new measure will ensure no new-build property enters the valuation roll until it is occupied. Mr Mackay’s last budget also maintained the Small Business Bonus Scheme, which lifts 100,000 properties out of business rates altogether.